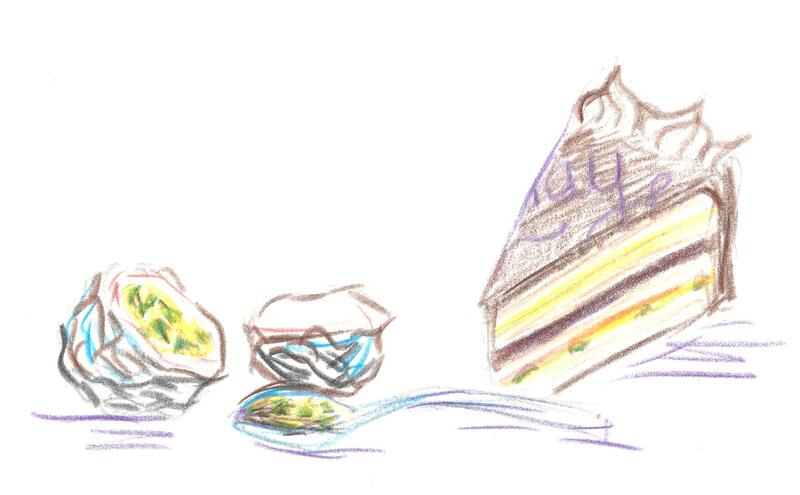 It always make me sad when, upon admitting what I do for a living, I am told “Oh no, I couldn’t possibly bake a cake for you!” I learned to be a pastry chef because I like to eat cake and because I know how much pleasure it affords to offer cake to others and have them enjoy it. Baking is a pure indulgence, both in the construction and consumption, a fairy tale of spun sugar. If people are afraid to bake for me, they lose out on that satisfied feeling of having created something totally frivolous and yet universally appreciated. What’s more, I would miss out on their speciality, their tricks and tastes. I love collecting others’ recipes and have miles more to learn. My cousin said exactly that when she brought over my birthday cake and it turned out to be wonderful, a soft chocolate sponge iced with a mix of whipped cream and Greek yoghurt, covered all over with sweet shreds of coconut. (Almost like a reverse lamington?) It was actually a variation on my favourite kind of summer cake, sponge and fruit and cream. So when the family challenged me to make something for the next week, I had to think again. This was the result, a total show-off’s torte, two punchy flavours and five different techniques. Soft almond meringue sponges sandwich glossy passion-fruit jelly, rich chocolate ganache and buttery passion-fruit curd, all iced with a delicate chocolate Chantilly. The thin layers all meld for a bittersweet mouthful, tempered by the luxurious cream. In reality though, it is not difficult to prepare, as long as you start the evening before so everything can cool. The sponges, less than a centimetre thick, take a few minutes to cook and the ganache and jelly are both left to set in cake tins so they can just be flipped out in the morning. This quantity of passion-fruit curd makes more than you will need for the cake, but it uses up the egg yolks and is delightful on toast. (A friend of mine introduces me not as ‘Frances, pastry chef’ but ‘Frances, this one time she made passion-fruit curd…’ It is that good.) 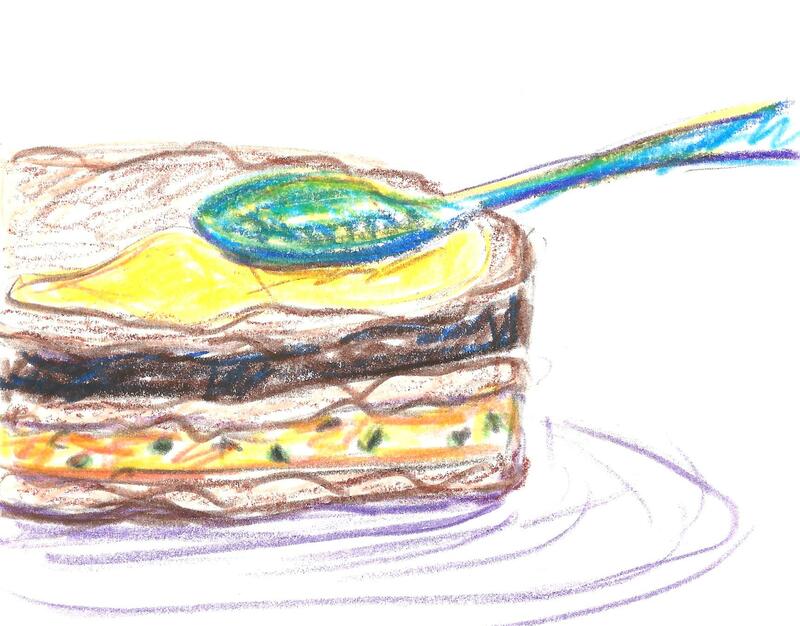 For a simpler cake, omit one or two of the layers: just use passionfruit jelly and curd, for example. Or easier still, make the meringue sponge then fill and decorate with Greek yoghurt and fresh passionfruit. The passion-fruit pulp I used came in a tin, 55% fruit including seeds, plus water and sugar. You can find it in supermarkets or speciality baking stores. G. Detou in Paris sells passion-fruit purée which is less sweet and has no seeds, so sweeten the curd and jelly accordingly. I wouldn’t recommend using fresh fruit simply because it will require too many, at least a dozen if not more. Alternatively, substitute with half orange and half lemon juice. The curd, jelly, ganache and Chantilly need to be made the day before. If possible, assemble everything a few hours before serving. Make the sponge: Preheat the oven to 175C. Draw four 20cm circles on separate sheets of baking paper, prepare four baking trays. Separate the eggs: put the whites in a large bowl and the caster sugar in a small one. Sieve the flour, ground almonds and icing sugar together, set aside. Whisk the egg whites. When they start to be white and opaque, add 1/3 of the caster sugar. Let them gain some volume then add 1/3 sugar, repeat. They should be fluffy and stiff but still smooth. Fold in half the almond mix, trying not to lose the volume, then the other half. Divide mixture onto your four circles (140g each) and smooth out to the edges, again careful not to touch it too much and knock out the air. They will be quite thin. Bake for 10-12 minutes, turning them round halfway if your oven isn’t even, until golden brown. Remove paper from baking tray to let cool. Leave them on the paper, stack them up and wrap in tinfoil overnight. Make the jelly: Soak the gelatine sheets in very cold water. In a small saucepan, heat the passion-fruit pulp until it just bubbles. 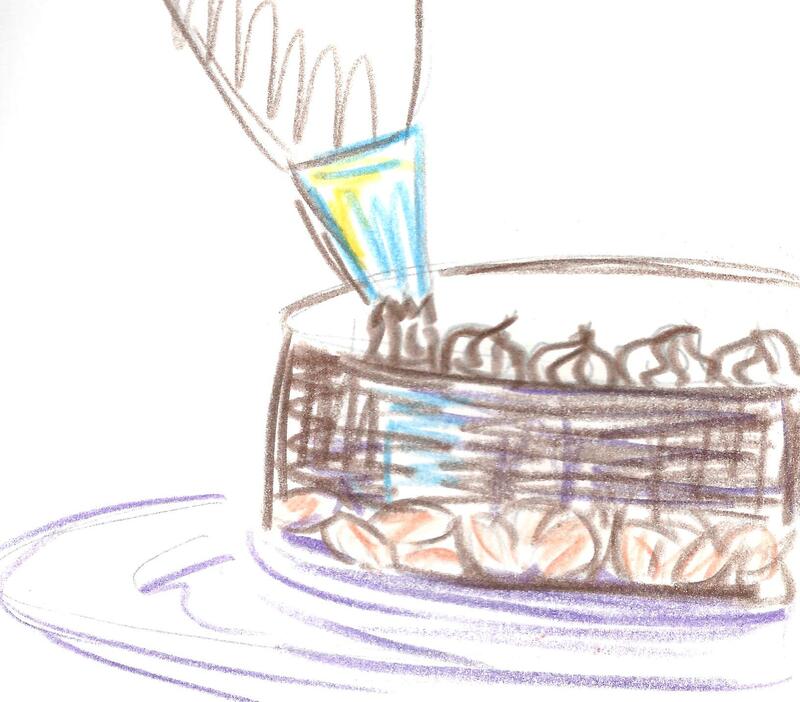 Line a 20cm cake tin with clingfilm. By the time the gelatine is floppy, the pulp should be warm but not hot (over 60C will kill the gelatine). Squeeze out the water, stir the gelatine into the passionfruit and pour into the tin. Refrigerate. Make the passion-fruit curd: Cut the butter into cubes, chill. In the same small saucepan on a very low heat, whisk the passion-fruit pulp, sugar, egg yolks and whole egg. Keep whisking for 5 minutes or so, it will go very pale and double in volume. As soon as it starts to bubble, remove from the heat and add the butter. Stir until melted, then pour into a jar and refrigerate. Make the ganache: Line another 20cm tin with clingfilm. Melt the chocolate carefully in the microwave or double boiler. Heat the cream in a small saucepan until it just bubbles. Pour the cream into the chocolate 1/3 at a time, mixing well in between. When smooth, pour into the tin. Clingfilm the surface and refrigerate. Make the chocolate Chantilly: using the same bowl and saucepan, melt the chocolate and heat the cream. Repeat the process. When well combined, blend with a stick blender for just 15 seconds to make it really smooth (optional). Clingfilm the surface and put the bowl in the fridge. The next day: Layer the cake. Carefully flip the passionfruit jelly onto the first sponge layer, peel off the clingfilm, then top with another sponge and do the same with the ganache. Add another sponge and spread on a thick layer of passionfruit curd. (You will only need half the quantity.) Add the final sponge, upside-down so the top is smooth. Whisk the cold Chantilly for a minute or so. It won’t be as stiff as plain whipped cream, and might split if over-whipped, so stop when it is thick and just holds its shape. Smooth over the top and sides of cake, use any leftover to pipe decorative squiggles. Chill the whole cake until serving so that it all melds nicely together. This sounds incredible!! Especially the ganache – I’m lactose intolerant and it’s pretty tricky to make a dairy free substitute 😦 also puts people off making cakes for me too! It is not easy to skip certain ingredients is it? Especially butter/milk/cream! But the cake layers and the jelly are dairy free – and you could try making the curd without the butter, adding some gelatine to have it set. (The same amount as for the jelly perhaps.) Then top with plain melted dark chocolate? I get the same. After choosing this as my life, I am the designated dessert-maker. I make my own birthday cakes and everything now. booo…. I bet you make the best birthday cakes though! This sounds incredible! I’ve been thinking about spooning into all those layers ever since I read the post. Need to go buy some more passionfruit pulp and get on it.